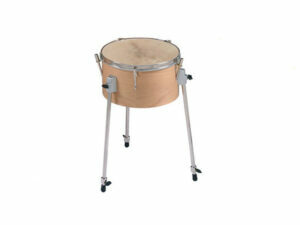 STUDIO 49 Timpani feature a body made of firmly laminated hardwood, tunable skin head, and adjustable legs. Richness and purity of the beat depends on the precise, all-around tuning of the head. The required pitch must by obtained by adjusting all the tension screws. The natural skins have a warmer timbre than the somewhat dry sound of plastic heads. Rosemary P. loves STUDIO 49 because the sound and resonance is great. The 1000 series is so nice. Whe had one as a door prize for an Orff Chapter (CFOC) and it was a big hit. Everyone loved it! Kelsey C. loves STUDIO 49 because they have such good, musical sound! The students love playing on these instruments, and she loves hearing them!